This entry was posted in Breeding, Varroa level, Varroa resistance, VSH and tagged alcohol wash, counting mites, DWV, resistance, thymol, varroa resistance, virus by Erik. Bookmark the permalink. When reading your blog, I had one thought when you mention that you want to prevent reinfestation of mites from colonies with lot’s of varroa to others with low infestation level. I would like to mention, that mites have some positive aspect too. They are needed to keep and develope resistance traits, both genetically and epigenetically among your bees. I remember a discussion with Adam in the vsh breeder blog, who mentioned that he wants to have some colonies that even crash by mites, to achieve the above mentioned goals….. It will not be difficult to move some bees closer to other beekeeper’s bees if this problem with too few mites turns up. Hi Rüdiger, nice to meet you here. Thinking about this I would like to know how one can distinguish between a hive which is as much resistant as being able to stand a high mite pressure and one which develops the virus sicknesses after having not much mite infestation. So the colony which seems the most infected( by number of mites, not virus, to be sure), could be the best! In this case a treatment could be contradictory. 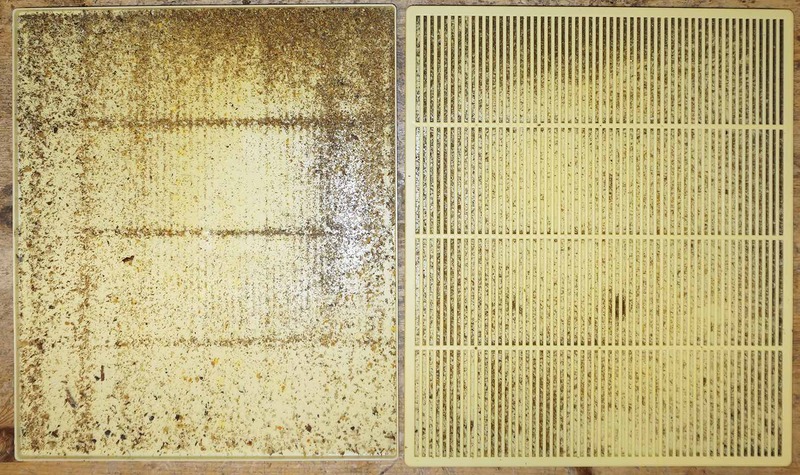 To check mites with bee shaker or varroa board treats colonies like they are all the same. Even though, it`s entire possible you see no defect wings, but other illness inside a weakened colony (weakened by fighting varroa, having no time to develop much brood, having not much foragers, or by management of beekeepers or all together). They even could be resistant to DWV but not to CPV, like my experience was. Maybe we should be more careful our with managements, protect the bees more, preventing robbery with leaving more honey inside for example or having small entrances. Let them supersede an old queen….and so on. Maybe we should breed from hives with good wasp defense or examine the mites which fall down with a microscope, looking for bees biting them. The more there are on the boards, the more could be sorted out by bee defense! So I would rather use the shaker and do an examination of the mites on boards later on. And look for some VSH behavior on combs while checking. The bee shaker, mostly for me, and varroa board, are means of additional information. They are no Lords of decision. You are the queen (and king). Without this hekp you would have greater difficulties knowing for example that some hives have more mites, but without virus symptomes, than others which do have virus symptomes. Yes, Virus resistance is important. But hives with many mites are potential risks for other colonies. So it’s sometimes difficult what action to take or not to take in different situations. The more information you have often times the better. To take a decision and later on you collect or experiences and try to understand to help further decisions. What yo always can do when you find a colony with many mites but withus virus signs is to wait another one or two weeks and make another test. Maybe the colony has fought down the mite level? Sometimes the decisions to do something or not are difficult to decide. You are just right saying hives with too many mites are a risk for your apiary, they are a risk for other beekeepers, too, if you wait too long to act.